Students will use a bomb calorimeter to measure and calculate the amount of energy (calories) within various foods. What is the amount of heat absorbed by the water? How much energy is in each food sample? 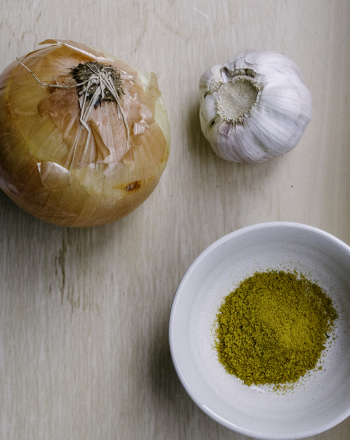 What affect does cooking food have on calories? Cellular respiration is the process of converting energy from food into ATP for cellular metabolism. Energy from food is measured in calories. The calorie is a unit of measure for the amount of energy required to raise the temperature of 1gram of water by 1 degree Celsius. 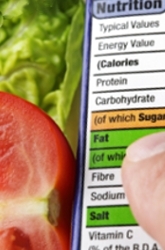 Food (nutrition) labels show the number of calories in a serving. However, a food calorie is equal to 1000 calories (1 kilocalorie, kcal), therefore a food calorie is the amount of energy required to raise a kilogram of water 1 by 1C. Although a food calorie is actually 1 kilocalorie the food industry still uses the term CalorieInterchangeably with food calorie. 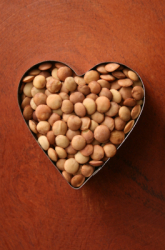 Proteins, fats, and carbohydrates are the main contributors to the calorie content of food. When we cook food the amount of energy changes. We cook food for various reasons, most notably taste, making foods more digestible, and killing bacteria or other organisms within the food. Do you think cooking food will increase or decrease calories? 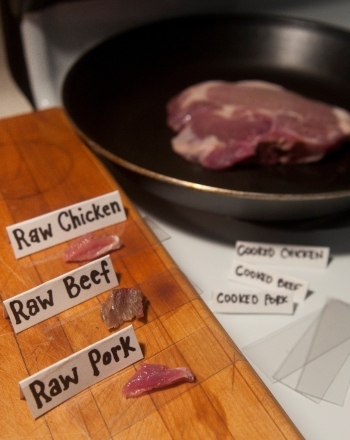 In this experiment students will measure the amount of calories in raw and cooked foods to determine the benefits, or drawbacks to cooking food. Bomb calorimeter set up: refer to diagram. Set up the top ring stand and place the mesh screen on top. 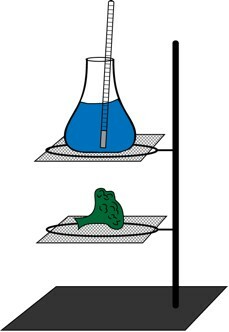 Place the Erlenmeyer flask on the mesh screen. Weigh the flask when empty. Fill the flask with 100mL of water. Weigh. What is the mass of the water? Repeat this step for every sample. Insert the thermometer and place a piece of aluminum foil loosely around the mouth of the flask and around the thermometer. Set up the 2nd ring stand below the first and place a mesh screen on top. This is for the food sample. Depending on the size of your food sample the bottom stand should be adjusted so that the flame is close to the base of the Erlenmeyer flask. Weigh your raw food samples. First weigh the mesh screen then place the food sample on top of the screen and weigh. What is the mass of the food sample? The food sample should be about 2 cm3. Record all the weights on a chart. Place the sample on the bottom ring stand/mesh support. Light the food sample using a lighter or matches. It may take some samples longer to ignite depending on the water content. Record the temperature of the water immediately after the flame is extinguished. The food sample should burn completely. Convert the energy consumed into calories. To determine the amount of calories within the sample divide energy by the sample weight. For the second portion of this experiment the food samples will be cooked. Use a microwave, frying pan, or steamer to cook your samples. Repeat steps 2-9 with each cooked sample. Organise your data in a chart. What happened to the amount of calories when the food was cooked? Give an explanation for this change. Russo, Ruthann. The Raw Food Lifestlye: The Philosophy and Nutrition Behind Raw and Live Foods. North Atlantic Books; 2009. Demonstrate if cooking destroys all bacteria that is present in raw meats such as salmonella. Raw or cooked? 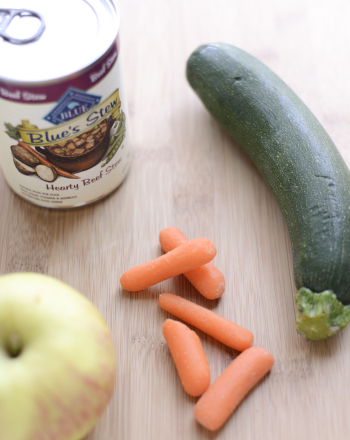 Test your dog's preferred diet in this fun experiment. The objective of this experiment is to find out if cooked beans grow faster, if at all, than uncooked beans. Can Certain Foods Make You Smell? Discover whether eating certain foods will make you smell (not only bad breath) but through skin cells.